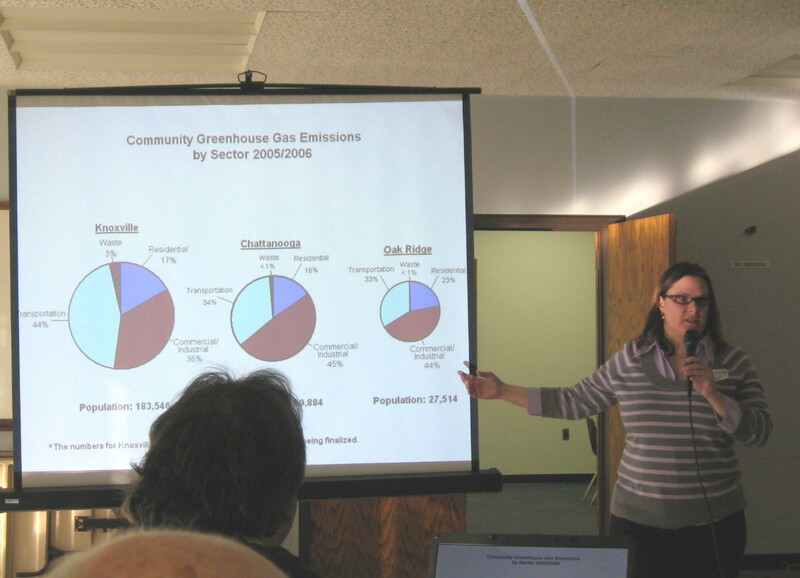 The process used at the Saturday forum was based on the process followed to elicit community input to Chattanooga’s climate action plan, which had been published two days before the Oak Ridge forum. Jim Frierson of the Chattanooga Green Team spoke at the forum regarding Chattanooga’s experience, helping to set the stage for our discussions. The heart of the forum was a set of six facilitated discussion groups focused on six different general topics. Attendees spent 15 minutes in each topical area, sharing their ideas on things that Oak Ridge possibly could do to reduce energy use or otherwise promote sustainability. Volunteers from the community served as facilitators, and ideas were recorded by EQAB members who volunteered to be scribes. It was clear that the interactions between people stimulated a lot of good thinking. Within about 2 hours, each topical area had a list of roughly 100 ideas. There was minimal discussion of the ideas — the purpose was to generate ideas, not to evaluate them. Evaluation (for example, of cost, feasibility, and potential reduction on greenhouse gas emissions) will come later. After the small-group sessions, participants were asked to go around the room and give votes (in the form of stickers) to their favorite ideas. Because each person had only two votes and little time to scan the lists, I don’t think this part worked very well — there were far too many ideas for most people to be able to make a meaningful choice of just two “best” ones. I heard a lot of positive feedback about the process. People enjoyed meeting and interacting with their fellow citizens — this was not a crowd in which everyone already knew everyone else, so people were seeing new faces and hearing new perspectives. I think people particularly appreciated that the request for their opinions was essentially open-ended, rather than being framed in a way that narrows the range of “acceptable” answers (and may not allow citizens to say what they really think). Several people said that this type of format should be used for other City efforts to involve the public in decision-making — such as planning for the Melton Lake waterfront and marina area. All of the ideas need to be reported publicly soon, and there will be more opportunities for public input — as well as evaluating ideas to find the ones that make the most sense practically, economically, and to achieve environmental goals.